Last night, in the wake of a recent Boston Magazine article about how the craft beer industry has abandoned Jim Koch and Sam Adams, the beer’s local rep teamed up with City Tap House in University City to try to prove otherwise. 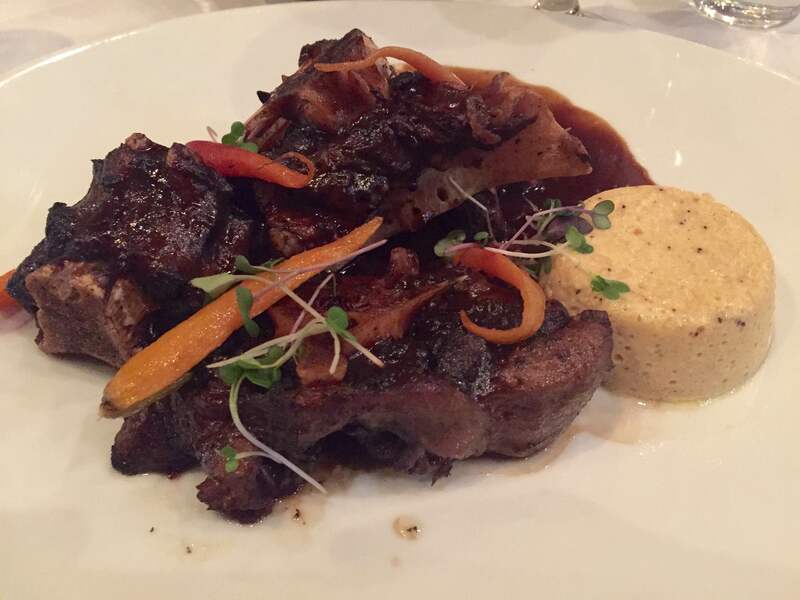 The team used a three-course dinner, with Sam Adams beer pairings, to prove the hashtag #SamStillMatters. The dinner began with a first course of pork belly atop pork rillettes, alongside a frisee and Treviso salad with a chocolate vinaigrette, and was paired with Kosmic Mother Funk Grand Cru. The sour “KMF,” as chef Chad Vetter explained, worked well to cut through the rich pork and the chocolate vinaigrette—which it did, and did well. And even though I don’t like frisee lettuce or chocolate, I thought the dish (and the beer) were very good. For our second course, rather than contrast flavors in the beer and food, Vetter decided to pair like flavors with his black pepper oxtail and smoked hedgehog mushroom flan, which went with Sam’s Black Harbor Stout—an imperial stout aged in Buffalo Trace barrels with a hint of black pepper and dark fruits. This was by far the best course of food, and Chef Vetter really shined in the smoked mushroom flan, which was a person favorite of the night. For dessert, we were served cheesecake in wonton wrappers smothered in a fig compote, with a side of hazelnut whipped cream. I’m not much of a dessert person, but this was delicious—and paired perfectly with the star of the night, a one-ounce pour of Utopias. For $50 for the meal, the experience was really a bargain—three great beers from Sam Adams (including a chance to try the ultra-rare Utopias) and three excellent courses from City Tap House—food of a caliber I wasn’t aware they could produce. That part of the night was excellent. However, the event was promoted as a “community meal and discussion” about whether Sam Adams was still relevant. Aside from the Sam Adams rep giving us descriptions of each beer, there was no discussion (and there were other Sam Adams employees at the table with us). After describing each beer, the rep went to his own table to ate by himself. I was looking forward to a community roundtable on the pros and cons of Sam Adams, and a discussion from craft beer fans and writers as to whether it still was actually relevant. And while the dinner proved that they still make good beer, it didn’t go any further toward deciding if Sam still mattered or not. 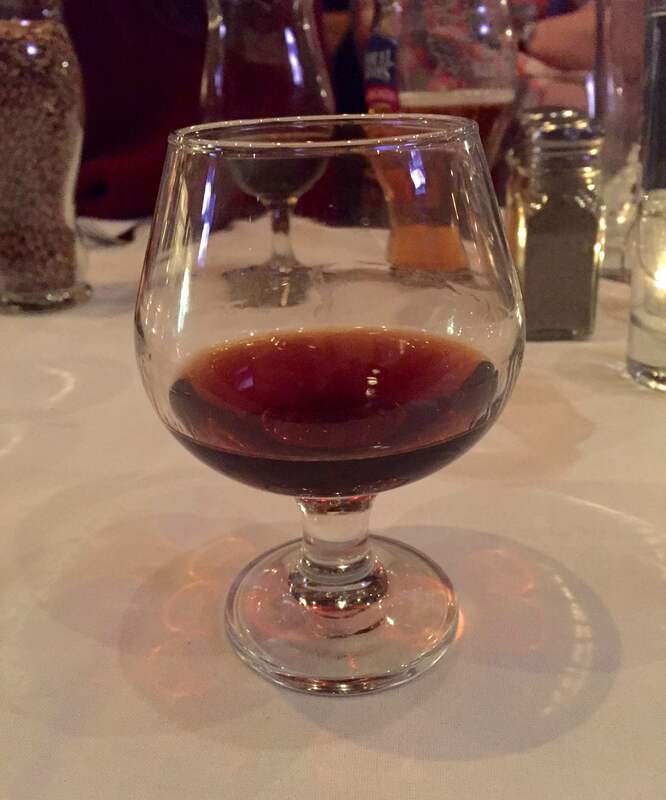 While the Utopias was a great addition to the evening, exposing people to a bottle they will most likely not see again (and most likely not be able to afford if they did), is not the best way to go about proving relevance. They proved Sam Adams still makes tasty beer, but that’s about it. In the end, the beer and food were great, but I still don’t know why I should care about Sam Adams—and with the isolation and lack of discussion from Sam’s employees, it seemed like they didn’t know, either. Recently, Lagunitas Brewing Co. in Petaluma, CA initiated and then rescinded a trademark infringement claim against Sierra Nevada Brewing, feeling that the letters “IPA” written across a beer label (for a different beer name, in a different font, with clarifying words in front of it) were too similar to their own “IPA” letters written across a beer label. 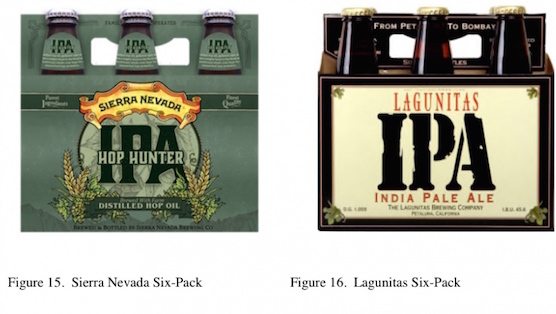 Once the internet attacked Lagunitas for a largely frivolous lawsuit (see the images and notice that they are not alike in any way, other than referring to the beer style), Lagunitas called it off. 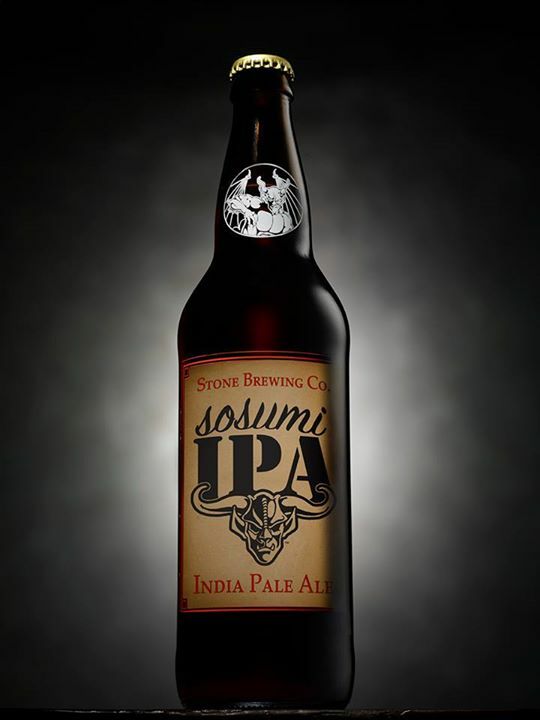 Now, whether or not the lawsuit was ridiculous or not (it was), Stone Brewing Co. decided to have a little fun at Lagunitas’s expense by releasing a fake beer on their Facebook page: Sosumi IPA, clearly using Lagunitas’s IPA font for the design. Now, it is quite possible that the two brewery owners are good friends and just enjoy taking the piss out of each other, but it seems the ways in which they make fun—especially since they themselves have resorted to lawyers to combat a not-even-close name relationship. It was within the last year that Stone Brewing Co. issued a cease-and-desist notice to Boulder, CO brewery, The Kettle & Stone Brewing Co. Uh oh, they used the same word in their name—clearly a cause for lawyering up to protect Stone’s brand from a brewery that isn’t in the same city, doesn’t use the same font or writing, and has a completely different logo. I could see if they had named themselves something like Stone’s Brewing Co. and had a devil-like logo—that would cause market confusion. But just happening to share a single word? The Kettle & Stone eventually changed their name to Vindication Brewing Co., certainly as a dig at their much larger and much more powerful Stone Brewing. So, what do you think? Is it okay for Stone to have a little laugh at Lagunitas’s expense, or is this joke just a tad too hypocritical, given Stone’s past actions? Let us know in the comments. On February 21st and 22nd at the Valley Forge Casino Resort, the Philadelphia Inquirer will present the Travel & Culinary Expo, which will gather the three things we love most here at In Search of Beer: Travel, Food, and Beer. For someone who often travels to eat, the combination of travel and food go hand-in-hand at the expo, with dozens of local restaurants sampling food, a Mid-Atlantic beer pavilion, and hundreds of travel vendors able to answer questions and book vacations on the spot. The event will run from 10am – 5pm on Saturday the 21st and 11am – 4pm on Sunday the 22nd. Tickets are $12 in advance (available on the website) and $15 at the door. There is also an option for a $25 ticket (in advance, $35 at the door) for the tasting sessions at the Craft Beer Pavilion, which will run from 12 noon – 2:30 and 3:30-6pm on the 21st and 1 – 3:30 on the 22nd. 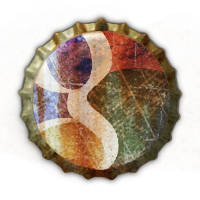 The sessions will feature over 30 beers from 20 different breweries, and will also provide information on brewery tours. On Saturday, local beer writers extraordinaire Don Russell and Tara Nurin will be on hand to talk about how to find the next great beer. As for the food, there will be the aforementioned samplings from local restaurants, as well as culinary demonstrations on the Culinary Stage. Some of the presenters will be local legend and host of FrankenFoods Tony Luke, Chef Glenn Gross of Fat Jack’s BBQ and the show BBQ Pitmasters, Roberta Pepito (known as Philadelphia’s Rachel Ray), and Barbie Marshall from the show Hell’s Kitchen. Cheese monger and local favorite Sue Miller of Birchrun Hills Farms will also be doing a cheese and cider pairing with Frecon Ciders. In addition to all the travel vendors at the event, there will also be talks from celebrated travel writers, including the legendary Arthur Frommer, who will talk about where to splurge and where to skimp on your next vacation, as well as go over some potential spots you may not have considered. Larissa & Michael Milne of the Inquirer’s Changes in Longitude travel blog will be discussing their new book, “The Philadelphia Liberty Trail,” and authors Reid Bramblett and Max Grinnell will talk about travel to Italy and America’s East Coast. If you’ve got the unshakable travel itch, as we do, you can start your travels with a quick trip to Valley Forge to learn more about the different places—and ways to get to those places—that await you. To quote the Amazing Race, the world is waiting. Don’t keep it waiting too long. While the blog has taken a bit of a break recently, we had to come back for one of our favorite beer events of the year. 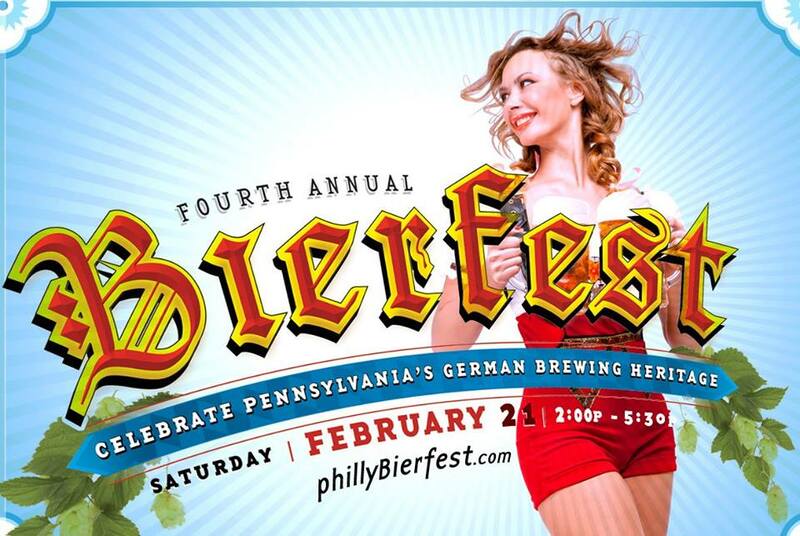 We’ve said it many times before—every year it’s been in existence, actually—but Philly Bierfest, presented by Marnie Old, the German Society of Pennsylvania, and the Philly Roller Girls, is consistently one of the best fests in Philly. Taking place this year on Saturday, February 21, from 2pm – 5:30pm for its fourth year, everyone should be buying tickets. What makes the fest so great is that it never rests on its laurels and says, “We’ve got German beer and German food—that’s enough.” What started as a single-room beer fest with local breweries and some food from Brauhaus Schmitz has expanded into multiple rooms across two buildings—the German and Latvian Societies both. Every year, more events are attractions are added, and 2015 will be no different. There will be a beer and cheese cave this year, where PA brewers will team up with local and imported cheeses, with pairing lessons from cheese expert Max McCalman. Bierfest will also offer some of the favorites from past years, including themed variety acts from Shuhlpatter folk dancing to “Berlin-style BEERlesque,” as well as free kindercare for thirsty parents and beerless tickets for designated drivers; there will also be favorite games like arm wrestling a Roller Girl and the Masskrugstemmen liter lift. Bluegrass music from the Keystone Mountain Boys will also return to the fest. Once again, a great selection of local breweries will be on hand to offer their German-styled beers, including Barren Hill, Berwick, Free Will, Lancaster, Lion, Nodding Head, Penn, Philadelphia Brewing, Round Guys, Samuel Adams, Sly Fox, Susquehanna, Victory, Yuengling and more. On the import side, featured German brewers include Ayinger, Warsteiner, Sünner, Miltenberger, Pinkus, Wolters and many others. Classic German cuisine will be provided by Wursthaus Schmitz. As with past years, there will also be an informational element to the event, beginning with a beer seminar and tasting regarding German Noble Hops from event coordinator and drinks expert Marnie Old, and later a Brewers’ Panel discussion entitled “The German Connection: PA’s Lager-Loving Terroir.” Having attending each and every seminar and discussion panel, we can say with certainty that even the most beer-centric drinks lovers will learn something new (and drink some great beer in the process). CORRECTION: Due to the cheese tasting this year, the Brewers’ Panel has been shelved until 2016. The cheese tasting and discussion is open to all ticket-holders and will begin at 4:30. Tickets come in three tiers, starting at $45 for general admission to the fest. There is also a $60 VIP package that will include early entry to Bierfest at 1pm, giving you an extra hour to enjoy the expanded food and drink selection. Finally, for $75, VIP Plus ticketholders will be treated to the 12pm beer seminar and tasting from Marnie as well as early admission to the fest. Both VIP-level tickets come with a commemorative Bierfest mug. Designated Driver tickets can also be purchased for $20, and rooms at the Philadelphia Marriott can be booked at a special event rate of $99 for Saturday night (ask for the Bierfest Room Block) for anyone coming from out-of-town. We cannot stress enough that this has been one of our favorite events of the year for the three years we’ve been, and it does keep getting better. There’s not much that will get us out of the house in February, but this is always on the calendar. 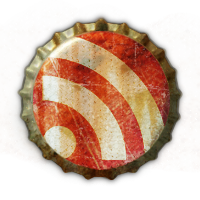 If you enjoy beer, food, and general fun, it should be on yours as well. When it comes to food and beer, our favorite events involve both quality and quantity. That’s why we get excited every year for the Philly Homebrew Club’s Made on America Street – now in its 8th year – both for its abundance of great beers from the club and excellent ribs from the annual rib competition. And if that’s not enough for you, there will also be a mac and cheese competition and a selection of side dishes as well. 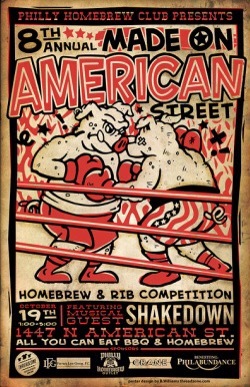 The event will close down American Street outside of the Philly Homebrew Outlet (1447 N. American) from 1 – 5p.m. on Sunday, October 19. During this time, guests will be afforded all-you-can-eat ribs and mac as well as all-you-can-drink autumn homebrews in a souvenir Philly HBC mug. How much will this four hours of autumnal excess cost you? A mere $35 in advance and $40 at the door. Or, if you choose not to accept the souvenir glass, tickets are only $25 in advance and $30 at the door. 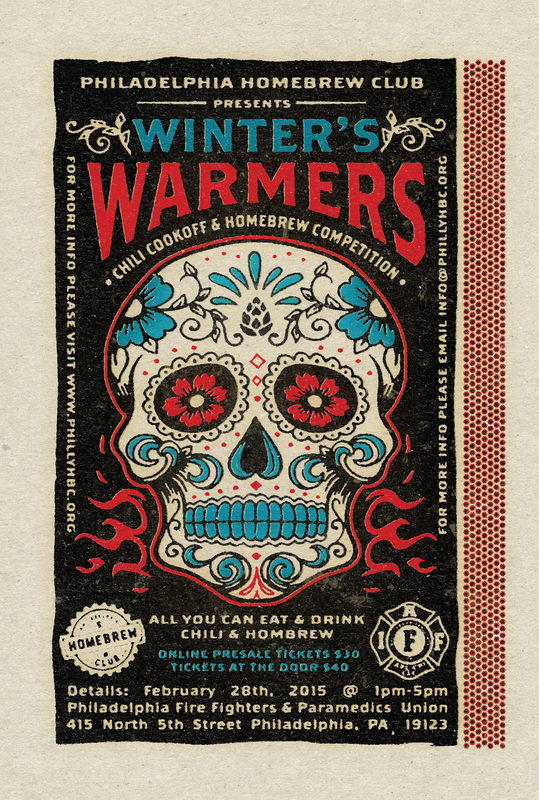 But you should get the glass, as this portion of the profits goes to the Homebrew Club and helps fund awesome events like this and their annual chili cook-off. Now, this sounds great, but what about your kids? Bring them along—this event function as any block party would, with live music, games, and even a bouncy castle for the kids. And to top it all off, children under 12 eat and drink (non-alcoholic beverages) for free. With all this and the gorgeous October weather, the event sounds pretty perfect. But wait—don’t your friends always comment on how awesome your BBQ sauce is? Or how great your dry rub tastes? Because there is still time to enter the rib competition, and prizes are excellent. For a $200 team fee, you will get four passes into the event as well as approximately 15 racks of pork ribs provided to your team the morning of the event. After that, it’s up to you to work your magic where you can win up to $2,400. 1st place for the rib competition will net you $1,600, first place for mac and cheese will get you $400, and peoples’ choice will get your $400 as well. Full details, entry forms, and prize breakdowns can be found at the PhillyHBC website. Made on American Street was a great time last year and promises to be once again—the homebrew club knows how to throw a party. Be sure to get your tickets (online at PhillyHBC.com) and rest easy knowing that the proceeds from the event are going to Philabundance and several local children’s charities and schools. Get your grills fired up and your stomachs ready for the ultimate farewell to summer and hello to fall, and I hope to see you there. 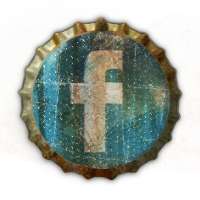 Be sure to follow us on Twitter at @insearchofbeer and on Facebook at Facebook.com/insearchofbeer, as we’ll be having a contest to give away two tickets to Made on American Street! Philadelphia has long been known for a certain week-long string of events with a beery focus, so it shouldn’t be any surprise that Brooklyn’s 10-city US tour (and two-city European tour) should stop here. The week-long festival, dubbed The Brooklyn Brewery Mash, will be in Philly from Saturday, September 27 through Saturday, October 4, and will celebrate “what’s next” in food, film, comedy, music, books and beer. Select event partners from Brooklyn and Philadelphia, in conjunction with Slow Food USA, will combine to create one-of-a-kind entertainment experiences for the local community in the form of food and beer pairings, a film festival, comedy shows, educational talks throughout the week. 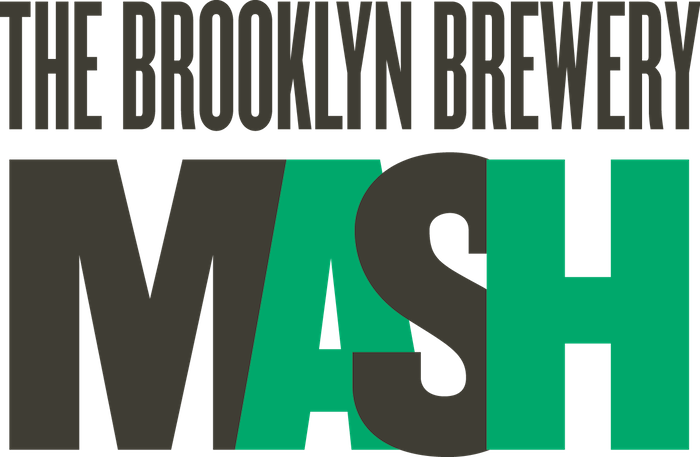 While some of the events are pay-as-you-go, tickets can be purchased for the ticketed events at BrooklynBreweryMash.com. The event we are looking forward to most is Dinner on the Farm with Chef Mitch Prensky (Supper) and Chef Andrew Gerson (Brooklyn Brewery). For $55, guests will arrive at Green Meadows farm at 3pm on Sunday, September 28, where there will be a farm tour, games, and events, capped off with a family-style feast prepared by the two chefs—plus plenty of beer, of course. The full list of activities and food is on the Mash website, and it looks like a real winner. Get your tickets before they sell out! Other highlights will be a Joe Sixpack-moderated talk with Brooklyn Brewery co-founder Steve Hindy as well as Tom Kehoe (Yards), Daniel Endicott (Forest & Main), and Erin Wallace (Barren Hill/Devil’s Den). They’ll be discussing the current state of beer as well as what lies ahead for only $6 on Monday, September 29 at 6pm at Yards. We’re also looking forward to a Beer & Italian cheese pairing with Emilio Mignucci (DiBruno Bros) at Vetri on Tuesday at 5pm and a pop-up Slow Supper with Dinner Lab at 7pm on Friday, October 3 (tickets are $60), which will feature seasonal fare paired with familiar and rare Brooklyn beer—all at a surprise location. Finally, don’t miss out on Mash EDU: Homebrewer Edition for $6 held by our friends at Philadelphia Homebrew Outlet. A full list of events can be found at BrooklynBreweryMash.com, where you can also purchase tickets to applicable events. If you’re a little short on cash, be sure to stop by the Mash beer brunch at Industry Bar on Sunday, Sept 28 starting at 11am, as one lucky diner will win a weeklong pass to all the events. Check the website, pick some events, and we hope to see you out and about. All of the events sound like fun, and some sound downright required for any beer- or food-lover worth their salt. 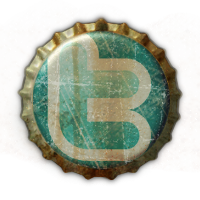 Keep up with the week on the website, or by following the #PhillyMash hashtag on Twitter. Let us know in the comments which events you plan to attend, and which Brooklyn beer is your favorite. See you out there!